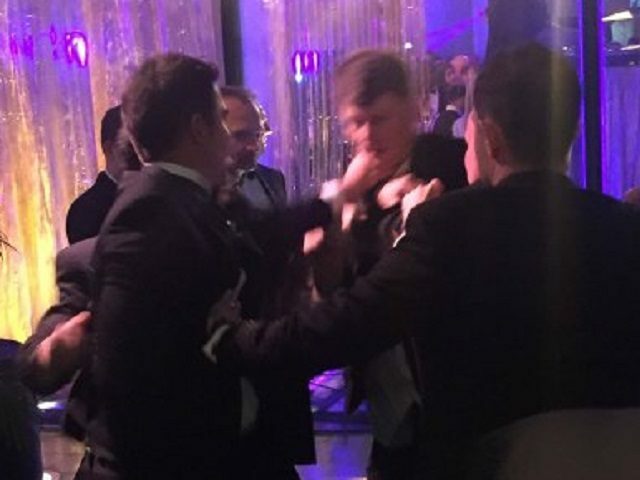 Guests at the White House Correspondents Dinner witnessed a brawl between Fox News’ Jesse Watters and the Huffington Post’s Ryan Grim. In the early-morning hours of Sunday, a scuffle broke out between Fox News correspondent Jesse Watters and Ryan Grim, the Huffington Post’s Washington bureau chief. The fight — unusual among a tuxedo-clad crowd more used to venting their differences with Twitter snarks — briefly caused ripples in the party, where political staffers and journalists were grooving to tunes spun by DJ Biz Markie and noshing on mini servings of chili cheese fries. Grim decided to give Watters a taste of his own medicine, whipping out his camera phone and filming him. Watters didn’t take well to this, eventually snatching the phone away from Grim and putting it in his pocket. Grim set out to retrieve it, and a scuffle ensued. No cinematic sparring or broken beer bottles, witnesses said, but the two flailed around a bit, upending a table and bumping into several people. Looks like someone stepped inside Watters World and took some incoming!